Click on this link and login with your Amazon account email id and password. On this screen scroll down to the section titled: Amazon MWS Developer Permissions. Note down your Seller ID. Click on the button 'Authorize a Developer'. On the next screen, enter developer name as: TrueGether. Enter Developer ID as: 8108-5825-5497. Click Next. On the next screen, accept terms and conditions. Click Next. On the next screen, Note down your marketplace ID. Also note down your MWS Auth Token. Now click on the 'Amazon MWS Permissions Developer Permissions' link on this page. 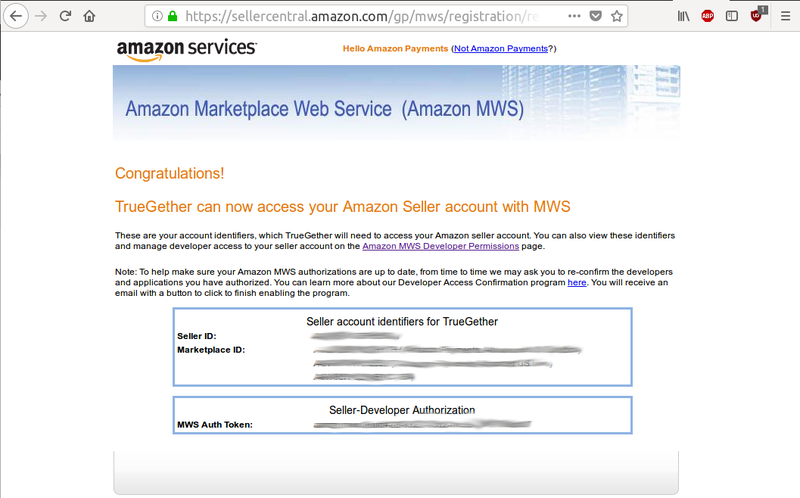 Scroll down to the section titled: Amazon MWS Developer Permissions. There are two tables in this section. In the second table, in the 'Action' Column, click on the link 'View your credentials'. Note down your AWS Access Key ID. Click on 'View' and note down your Secret Key. Now click on this link and login on TrueGether. When prompted to enter your Amazon Account details, you will need to enter information you collected in Steps 3, 7, 10 and 11.